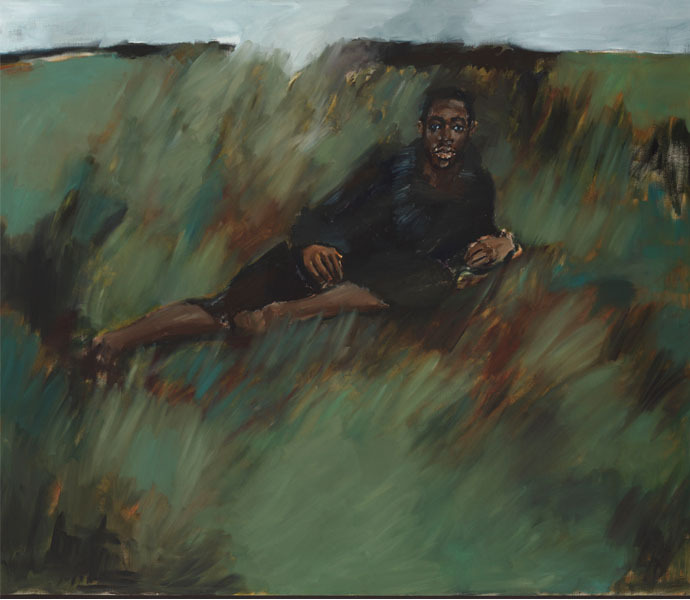 Our roving cultural reporter Elena Bowes is back in her home town of New York this week, chatting to curator Natalie Bell of the New Museum about Artist Lynette Yiadom-Boakye and her new show, Under Song For A Cypher. If you happen to be in Manhattan this summer, make a point of stopping in at the New Museum on the Lower East Side. 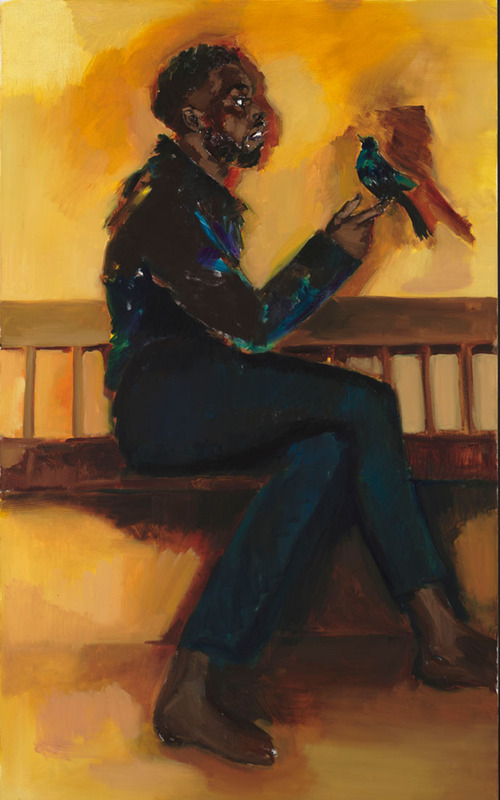 There on the 4th floor is a quiet, contemplative solo show lyrically titled Under-Song for a Cipher by British-Ghanian artist Lynette Yiadom-Boakye. This body of new work, each paired with titles like Vigil for a Horseman or Light of the Lit Wick hang in a single somber room. 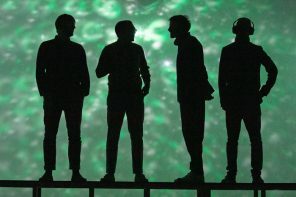 While Yiadom-Boakye’s paintings appear in several public galleries including the Tate and the Victoria & Albert, the Turner Prize shortlister is not well-known outside the UK. 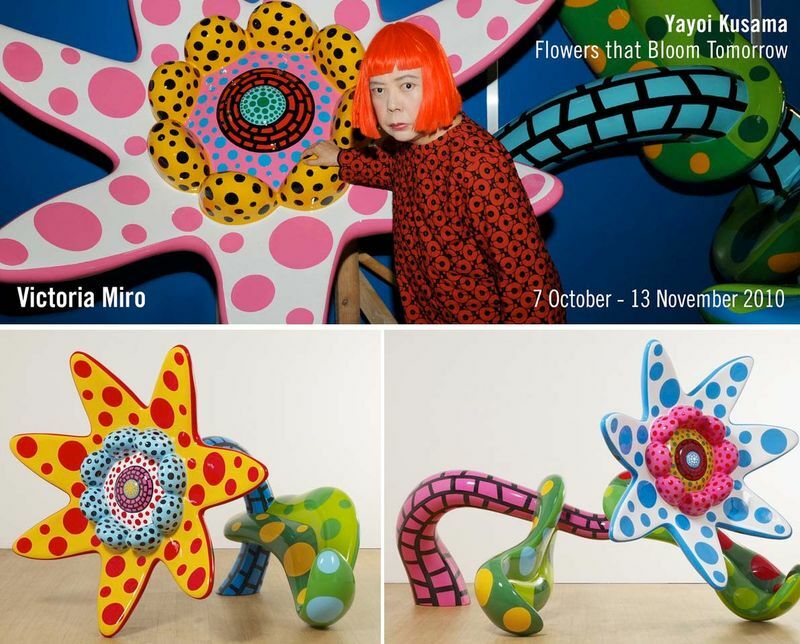 Another reason to make time for this show, which closes September 3rd, is that the talented Yiadom-Boakye is taking a sabbatical until 2019. 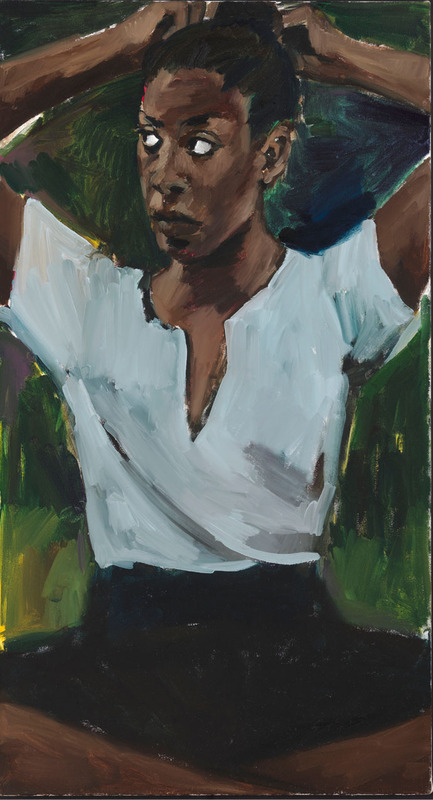 Yiadom-Boakye paints imaginary people born from scrapbooks, magazines, her imagination. Yet they seem so real that they could walk off of the canvas out the door into the Bowery. The figures painted on linen or canvas are all beautiful, all black and all appear to be lost in thought. Alongside each of the paintings are mysterious titles like, Ropes for a Clairvoyant, Mercy Over Matter, In Lieu of Keen Virtue. “They are character studies of people who don’t exist. 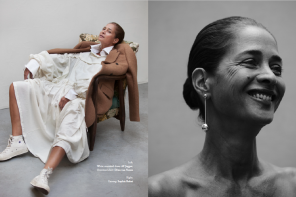 Subtleties of human personality it might take thousands of words to establish are here articulated by way of a few confident brushstrokes.” writes British novelist Zadie Smith in an excellent article in last month’s New Yorker. 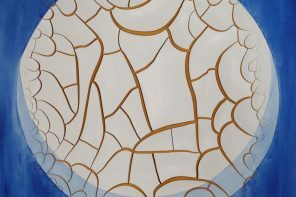 I discussed this thought-provoking exhibition with curator Natalie Bell. Yiadom-Boakye uses subtle layers of muted colours and tones in her paintings, with dabs of vivid reds, pinks, greens and blues. How she applies paint to canvas is just as intriguing as the figures themselves. Most of the 17 portraits at the New Museum are painted on linen, one is on canvas. She had been painting on canvas and only recently returned to working on linen, according to her London dealer Tommaso Corvi-Mora. This is important because linen takes longer to dry so Yiadom-Boakye who famously likes to paint wet on wet has more time to complete a painting on linen. 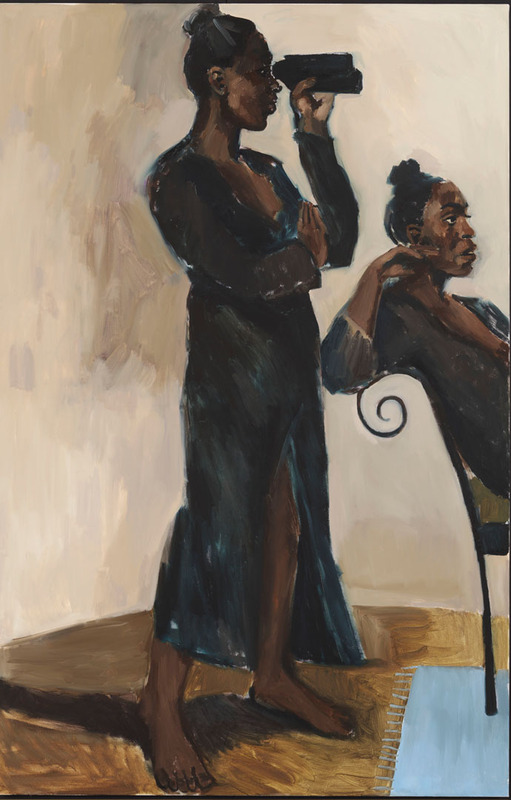 Lynette Yiadom-Boakye, Ever The Women Watchful, 2017. Is it true that when working on canvas, she typically completes the bulk of the picture in a day? What do you like most about her paintings? In an interview with you, Yiadom-Boakye said, “I think about the people a lot less than I do the painting” what do you think she meant? She said that she loves Degas, Manet and Sickert. She does paint a lot of dancers. To me her paintings are a bit melancholic, soulful. 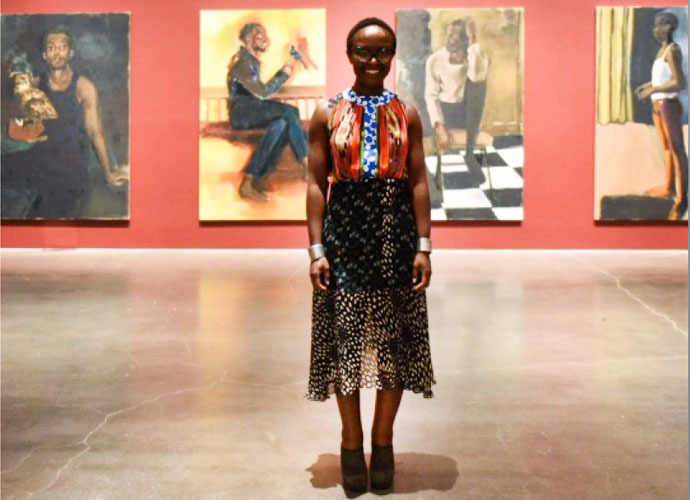 She paints from her imagination, she paints most of each canvas in a day, any other interesting details about Yiadom-Boakye? More on the exhibition here. More from Elena Bowes on her excellent blog here. All images thanks to the New Museum. Absolutely beautiful paintings. Thanks for posting them!